Finally, I decided to use the Raspberry Pi Wobbulator to test the frequency response characteristics of the G6LBQ multiband bandpass filter which I had built as part of a homebrew transceiver project. The fully assembled filter board is shown below (it is part of a Bitx Transceiver project I'm working on) and it covers the whole HF spectrum in 9 bands, all the way from the 160m band (1.8 - 2.0 Mhz) to the 10m band (28 - 30 MHz). Each bandpass filter uses a 3rd order Butterworth design and built using the "redeveloped" component kit from Spectrum Communications. Please note that there is a revised and improved version of the G6LBQ multiband bandpass filter due out very shortly - see the DX KITS web site for details. Prior to testing with the Raspberry Pi Wobbulator, each bandpasss filter was adjusted to give peak responses at the following frequencies on each band by connecting an RF signal generator to the input of the filter and measuring the output on an Oscillioscope (which is the "normal" way of adjusting such filters). 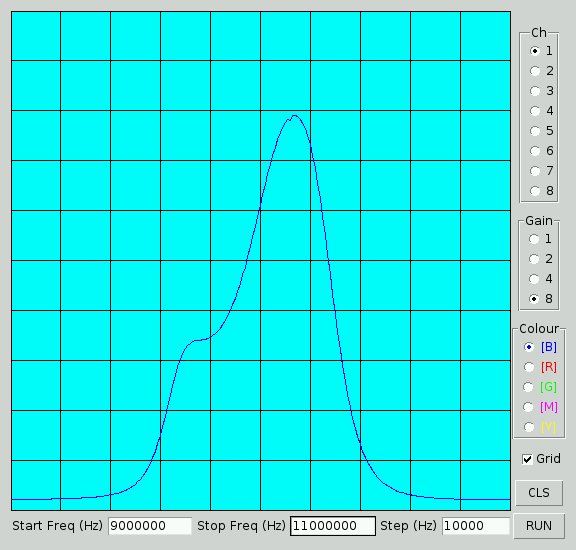 A screen shot of the results obtained from testing the 160m bandpass filter is shown below. Channel 1 on the ADC Pi module was used and the PGA gain was set to the maximum value of 8x. The wobbulator performed a sweep from 1.8 MHz to 2.0 MHz in increments of 1000 Hz (1 KHz) and the response shows a double peak centered around 1.9 MHz. 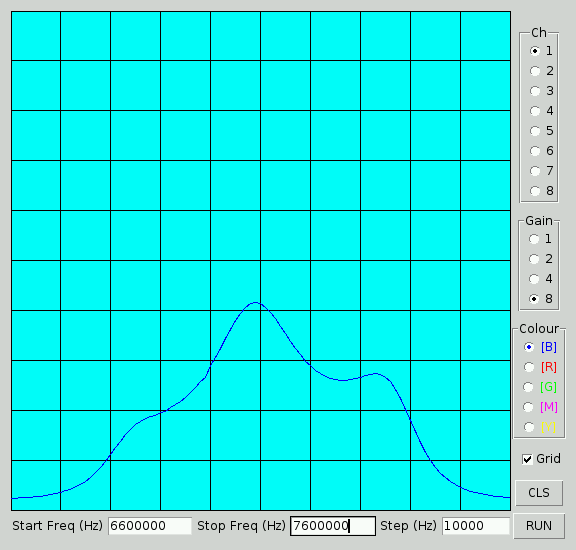 A screenshot of the results obtained from testing the 80m bandpass filter is shown below, using channel 1 on the ADC Pi module with PGA gain of 8x. The wobbulator performed a sweep from 3 MHz to 4 MHz in increments of 10 KHz, and the response shows a nice peak around 3.6 MHz. A screenshot of the results obtained from testing the 40m bandpass filter is shown below, using channel 1 on the ADC Pi module with PGA gain of 8x. The wobbulator performed a sweep from 6.6 MHz to 7.6 MHz in increments of 10 KHz. Although the response of the filter peaks around 7.1 MHz the response curve would suggest that the various filter elements are not well aligned. 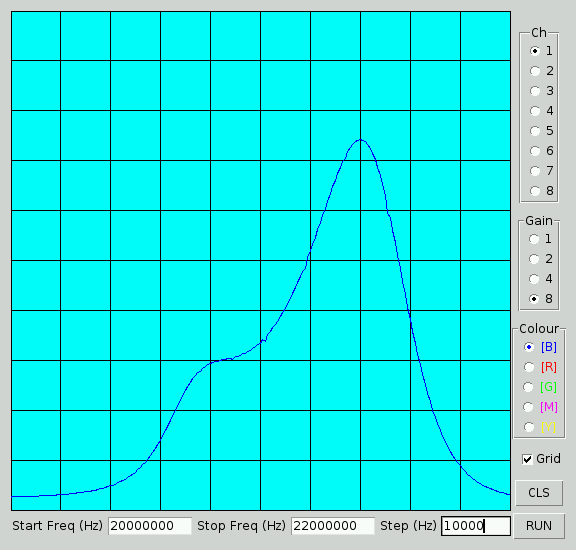 A screenshot of the results obtained from testing the 30m bandpass filter is shown below, using channel 1 on the ADC Pi module with PGA gain of 8x. The wobbulator performed a sweep from 9 MHz to 11 MHz in increments of 10 KHz. The response shows a peak around 10.1 MHz, but the response has a "shoulder" around 9.8 MHz which may indicate that the filter is not perfectly aligned. 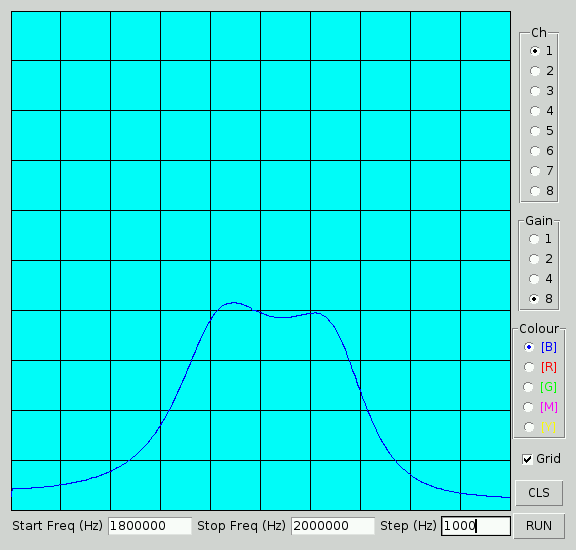 A screenshot of the results obtained from testing the 20m bandpass filter is shown below, using channel 1 on the ADC Pi module with PGA gain of 8x. The wobbulator performed a sweep from 13 MHz to 15 MHz in increments of 10 KHz. The response shows a peak around 14.2 MHz, and the useable bandwith would be between 14.0 MHz and 14.4 MHz, but again the response has a distinct "shoulder" on the lower side which may indicate that the filter is not well aligned. A screenshot of the results obtained from testing the 17m bandpass filter is shown below, using channel 1 on the ADC Pi module with PGA gain of 8x. The wobbulator performed a sweep from 17.1 MHz to 19.1 MHz in increments of 10 KHz. The response shows a peak around 18.3 MHz, which is too high, and there is a "shoulder" around 17.9 MHz. A screenshot of the results obtained from testing the 15m bandpass filter is shown below, using channel 1 on the ADC Pi module with PGA gain of 8x. The wobbulator performed a sweep from 20 MHz to 22 MHz in increments of 10 KHz. The response shows a peak around 21.4 MHz, which is too high side for this band, and again the response if not symmetrical either side of the peak indicating possible misalignment. 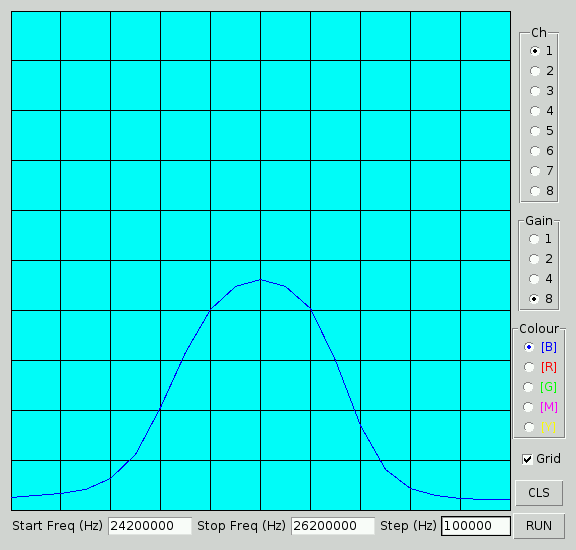 A screenshot of the results obtained from testing the 12m bandpass filter is shown below, using channel 1 on the ADC Pi module with PGA gain of 8x. The wobbulator performed a sweep from 24.2 MHz to 26.2 MHz in increments of 100 KHz. The response shows a broad peak around 25.2 MHz, which is too high for this band. 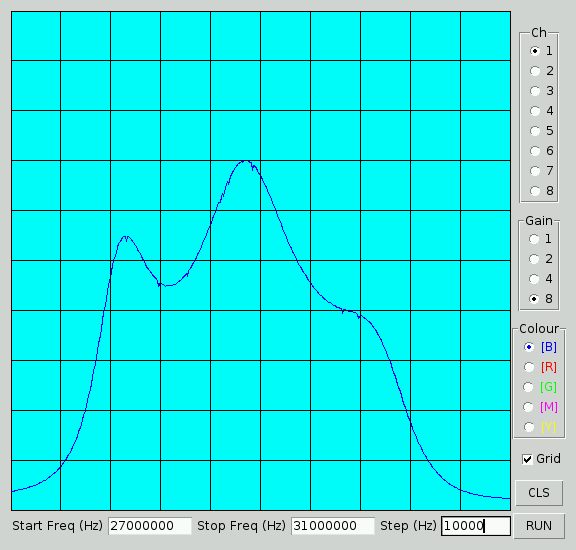 A screenshot of the results obtained from testing the 10m bandpass filter is shown below, using channel 1 on the ADC Pi module with PGA gain of 8x. The wobbulator performed a sweep from 27 MHz to 31 MHz in increments of 10 KHz. The response has a peak around 29 MHz, and a secondary peak around 28 MHz, indicating possible misalignment of the filter. Clearly using the Raspberry Pi Wobbulator to test the multiband bandpass filter provided much more information than could be obtained by simply peaking the response of the filter at a single frequency. The Raspberry Pi Wobbulator performed extremely well across the whole HF spectrum and produced some very useful results, however some care is required when specifying frequency sweep parameters - if a large sweep is specified with a small increment, the sweep can take a considerable amount of time to complete. For the radio amateur or electronic hobbyist, the Raspberry Pi Wobbulator provides a cost effective alternative to a “conventional” Wobbulator (or Sweep Generator, which also requires an Oscilloscope), or a Spectrum Analyser (which is beyond beyond the budget of most hobby users) for examining the frequency response characteristics of a circuit. Also please note that I have just received a small number of the DDS modules from the manufacturer in China - if you would like one please email me. fine job and nice project, have you published some schematics and parts ? If you have a look back through my last few posts all the details are there. I'm hoping to develop a PCB for the Wobbulator with everything on one board, but that may take a little while to sort out.